Have I mentioned how much I love to nourish? Wouldn’t it be amazing if every workplace environment (from corporate offices and banks to TV studios and radio stations or even work from home businesses) took 15 minutes every single day to soak their feet and relax…? Happier and healthier worker bees. Employees with gas in the tank to nourish themselves and their families when they get home. I want to wave my magic wand and make this possible everywhere. The crew on the WCSH 6 and WLBZ 2 Morning Report got a little taste of this recipe and I think they liked it! Until foot soaks are happening on the daily in your workplace, you can make it happen at home! 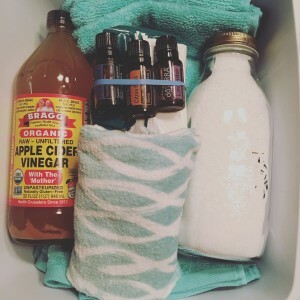 Add 1/2 cup Epsom salts, 2-4 oz of apple cider vinegar and a few drops of essential oil. Use this time to check out. Put your phone down. Read some fiction, or write in your gratitude journal. Really take the time to nourish yourself… Mind and body.